The Global Volcanism Program has no activity reports for Monte Burney. The Global Volcanism Program has no Weekly Reports available for Monte Burney. The Global Volcanism Program has no Bulletin Reports available for Monte Burney. The Global Volcanism Program has no synonyms or subfeatures listed for Monte Burney. Monte Burney, a large ice-covered volcano in the Patagonian region of Chile, lies about 200 km NW of the town of Punta Arenas. It was constructed on the western rim of a 6-km-wide caldera, which is partially filled with and surrounded by an unglaciated pyroclastic-flow deposit. Flank vents produced andesitic-dacitic lava flows and pyroclastic material. Collapse of the edifice produced a major debris avalanche that traveled to the SSW. Two large Plinian eruptions have been documented during the Holocene. The only known historical eruption took place in 1910. Kilian R, Hohner M, Biester H, Wallrabe-Adams H J, Stern C R, 2003. Holocene peat and lake sediment tephra record from the southernmost Chilean Andes (53-55° S). Rev Geol Chile, 30: 23-37. Stern C R, 2008. Holocene tephrochronology record of large explosive eruptions in the southernmost Patagonian Andes. Bull Volcanol, 70: 435-454. Stern C R, 1990. Tephrochronology of southernmost Patagonia. Natl Geog Res, 6: 110-126. There is no Deformation History data available for Monte Burney. There is no Emissions History data available for Monte Burney. 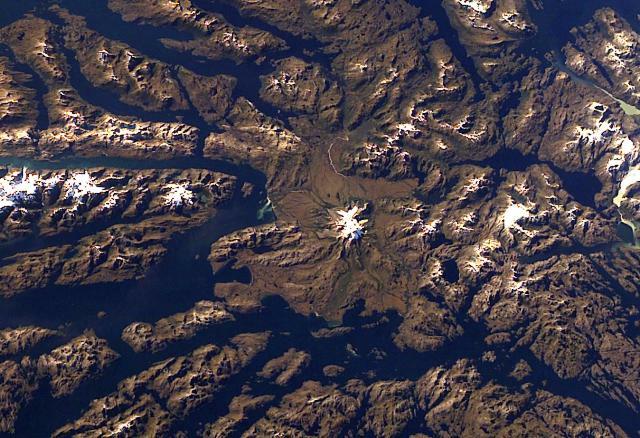 Ice-covered Mount Burney occupies the NW part of the Muñoz Gomera Peninsula in the spectacular glaciated Patagonian fjord region of southern Chile. The volcano lies near the center of this NASA International Space Station image (with north to the left). The rugged extensively glaciated topography surrounding the 1758-m-high Monte Burney is smoothed by volcaniclastic deposits from the volcano. NASA Space Station image ISS006-E-41451, 2003 (http://eol.jsc.nasa.gov/). There are no samples for Monte Burney in the Smithsonian's NMNH Department of Mineral Sciences Rock and Ore collection. Large Eruptions of Monte Burney Information about large Quaternary eruptions (VEI >= 4) is cataloged in the Large Magnitude Explosive Volcanic Eruptions (LaMEVE) database of the Volcano Global Risk Identification and Analysis Project (VOGRIPA).